The Ivory-billed Woodpecker (Campephilus principalis) is a very large and extremely rare or extinct member of the woodpecker family, Picidae. It is officially listed as an endangered species, and until recently had widely been considered extinct. Reports of at least one male bird in Arkansas in 2004 and 2005 were suggested in April 2005 by a team led by the Cornell Laboratory of Ornithology (Fitzpatrick et al., 2005). If confirmed, this would make the Ivory-billed Woodpecker a lazarus species, a species that is rediscovered alive after being considered extinct for some time. In June 2006, a $10,000 reward was offered for information leading to the discovery of an Ivory-billed Woodpecker nest, roost or feeding site. 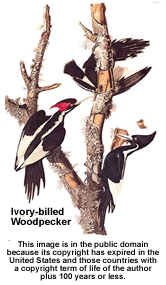 In late September 2006, a team of ornithologists from Auburn University and the University of Windsor published a paper detailing suggestive evidence for the existence of Ivory-billed Woodpeckers along the Choctawhatchee River in northwest Florida (Hill et al., 2006). Despite the initial reports from both Arkansas or Florida, conclusive evidence for the existence of a population of Ivory-billed Woodpeckers, in the form of unambiguous photographs/videos, specimens, or DNA from feathers, has not been forthcoming. Nonetheless, land acquisition and restoration efforts are currently underway to protect the possible survival of this woodpecker.